- Misc category: your examples are entry errors. I'll try to fix them soon. For the most part Misc is for exclusives & 1-offs that don't fit in a true size class. - G2: interesting. I'll probably save this one for later. - 2 Universe lines: yeah. Only problem is my system doesn't support 2 lines of the same name, and I'd like to stick to the official line names. That's a current conundrum. - Movie 1 vs ROTF lines. I've had this in the back of my head, but have been looking for some concrete reasons they are 2 lines. My only idea is (e.g.) Movie 1 deluxe assortment number is different from the ROTF deluxe assortment number. (same for all the price classes.) That's a weak argument though. The "changed box design" is pretty weak too. How do we "know for sure"? 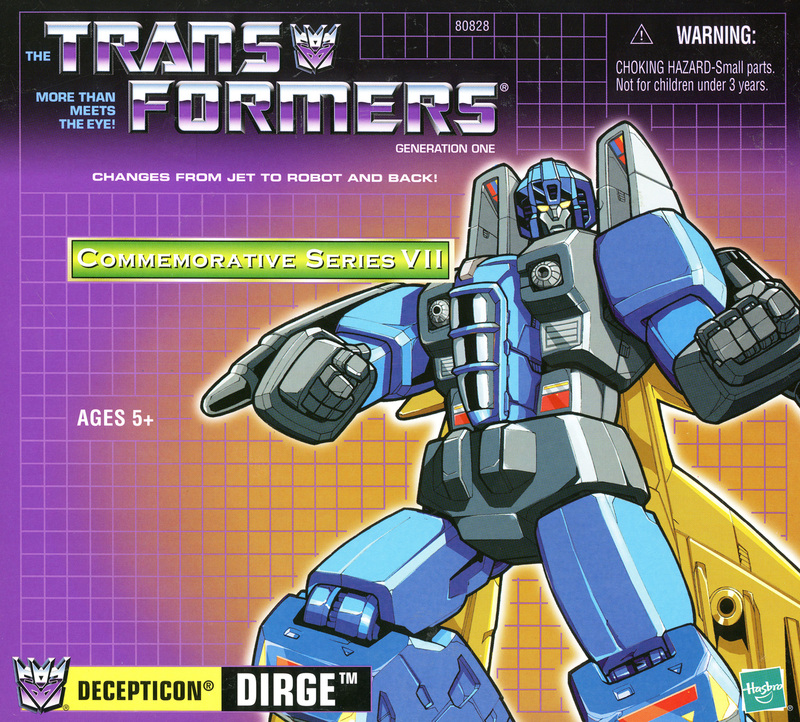 - G1 Reissues --> Commemorative Series: great. I was looking for a better name for those. Similar question to before - is that an official name? What's printed on the boxes? More than that? - Playschool Go-Bots: agreed. It's a work in progress. - 20th Anniversary Prime: He really doesn't have a good home. I'd rather not put him straight in G1, and extend the 1984-1990 year range for that series. I know he's not an alternator, but making a special series for him seems wrong too. Perhaps I'll just mark up that it's 'G1 / not alternator' in his name, or assortment name. - Animated figures for 2010: any figures listed that haven't come out yet are a "work in progress" and have a tendency to change. This is a common phenomenon. - Japanese/European lines: no plans at the moment, but it's been in the back of my head. Possible extension in the future. Last edited by blukis on Wed Jul 22, 2009 11:40 pm, edited 1 time in total. 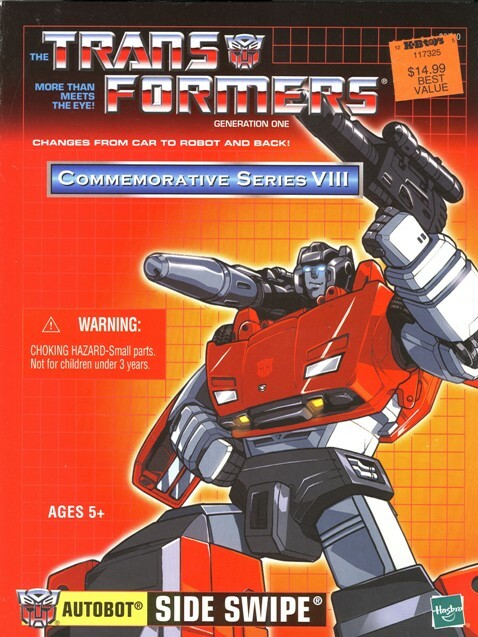 Yes, "Commemorative Series" is the official name, but only for those Toys'R'Us reissues (and the KB Toys Sideswipe, and the Hasbro Toy Shop Astrotrain). 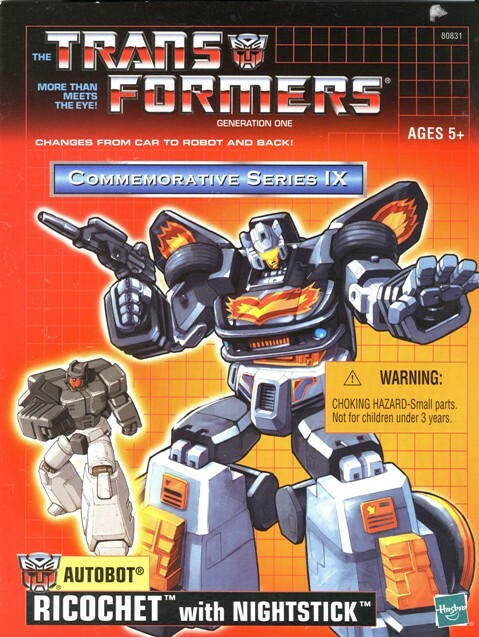 They used the G1 logo, but underneath had the "Commemorative Series" logo and number as well. The number would show which wave/series each figure belonged to. Here's some examples of what the boxes looked like. There have, however, been several other G1 reissues apart from this line. For example, there's the Fun-4-All keychain reissues of Bumblebee, Cliffjumper, Brawn, and Windcharger. As well as the Classics "Commemorative Edition" G1 Soundwave reissue, the Universe 25th Anniv. Optimus Prime, and the upcoming Universe "Commemorative Edition" G1 Perceptor and G1 Insecticon reissues. And much more U.S. and non-U.S. reissues that can all be seen here. Thanks. Those tfwiki links are a great resource. You bring up a lot of issues I've been dealing with maintaining this database over the years. Regarding Beast Machines Supreme Cheetor and Super Primal Prime, my system of price classes is driven only by unique assortment numbers. These figures may have been called "Supreme" and "Super", but Super didn't seem to get its own assortment number (what my system thinks of as a "price point") until RID. So they're entered more like 1-offs in my system until RID. I'm curious about your thoughts on that. I've always considered Optimal Optimus and Primal Prime to be Supers. Same goes for Cheetor, Air Attack Optimus Primal, Unicron, Omega Supreme/Sentinel, Starscream, and Primus as Supremes. Also, if you need more of the years for each series, check out this Wikipedia page. I noticed there were both series and years missing from it before, so I filled them all in. For once, Wikipedia has some true info because the person who filled it (myself) in was true. ROTF toys are now split into a separate series from the live action movie 1 series, and "G1 Reissues" is changed to "Commemorative Series". Thanks for the suggestions. For Armada checklist I can not seem to find the Gold Optimus Prime on the list that came in a two pack with Jetfire that was a K-Mart exclusive I believe. Also, didn't the Emergency Team and Sea Teams have recolors under the Armada name? Good catches. I added these to the list. Thanks! Topic revived. I noticed some additions made to the toy list like the 2010 line, the PCC line, and the Generations line. While skimming through the ROTF page, I noticed that the Leader Starscream figure is listed on this page instead of the proper 2010 page. I'm guessing that this was done back when we all assumed the Leader Starscream figure was going to be an ROTF figure, so it's understandable. But now that we know which line it belongs in, I'd say a move to correct page is in order. Listing is updated now. Good catch, and Thanks!